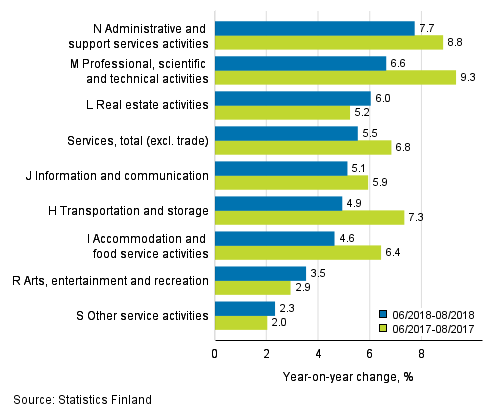 According to Statistics Finland, turnover in service industries grew by 5.5 per cent in June to August from the corresponding time period of the year before. The growth continued in all service industries. Administrative and support services activities (+7.7%) and professional, scientific and technical activities (+6.6%) developed most rapidly. Also real estate activities (+6.0%) rose more strongly than total services. Services are here examined exclusive of trade. The industry of administrative and support service activities was boosted most by employment activities (+11.5%). Of the sub-industries, travel agency and tour operator activities (+8.9%) and rental and leasing activities (+8.8%) grew at almost the same pace. The growth in turnover of security and investigation activities was clearly more moderate (+3.3%). Professional, scientific and technical activities was boosted most by scientific research and development (+14.1%) while the development of turnover in the other sub-industries was clearly weaker. The biggest service industry, transportation and storage activities, increased by 4.9 per cent from the corresponding period one year back. Of its sub-industries, land and rail transport rose by 5.8 per cent and warehousing and support activities for transportation by 3.8 per cent. Water transport reached a growth of 0.3 per cent. The main industry of other service activities developed slowly. Of its sub-industries, turnover in repair of computers and personal and household goods fell by 2.0 per cent. ISSN=1799-0998. August 2018. Helsinki: Statistics Finland [referred: 20.4.2019].